The other day my son expressed an interest in applying for one of those competition type reality TV shows. You know, like Survivor, The Amazing Race or, his favorite, Big Brother. Auditions and video submissions for Big Brother are going on now, I believe. Big Brother is the one where a group of people, called house guests, live together in a "house" (it's really a sound stage in a parking lot somewhere in LA) for three months in the summer. The "house" is isolated and cut off from the outside world. No internet, no phones, no TV, radio or music. They are not allowed to have books or reading material of any kind. The only thing they are permitted to do is interact with each other. The "house" is outfitted with cameras and microphones which record their every move, 24 hours a day. We, the viewers, are able to watch the houseguests via the internet. Each week, the houseguests vote out one of the group. The last person standing wins $500,000. I admit I am a fan of big brother. Okay, a big fan. I find it a fascinating experiment. When our electricity goes out, even for a short time, I get fidgety. I can't imagine my life without the internet. I've come to depend on it for, well so many things. News of family and friends, the latest knitting patterns and yarn sales, shopping and, of course, my bloggy world. If I had to choose to eliminate something from my life, it would be TV. I could easily do without TV. I thought, what if my son was one of the contestants on Big Brother? I wondered what that would be like. The first thought that came to me was, Wow, I would get to see him every day. I'd know what he was doing every minute of every day. Ha! Wouldn't that be something? I've not had that for a very long time. 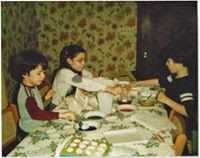 One of the things I realized after my son, Joe, passed away was how much of his life I didn't know about. I knew the baby, the little boy, the adolescent and yes, even the teen. But, when he went to live on his own we sort of lost touch. After he married and became a father, I feel that we were just starting to get re-acquainted on an adult level. My other son, the one who wants to be on Big Brother, is busy with work, his kids, his life in general. You know it's the typical mother-of-a-son mantra, "Call you mother!" So yes, for me it would be a nostalgic treat to be a part of my son's 24/7 life. To know what he was doing, thinking, feeling whenever I wanted. Just like those long-ago days. What you would be able to live without? 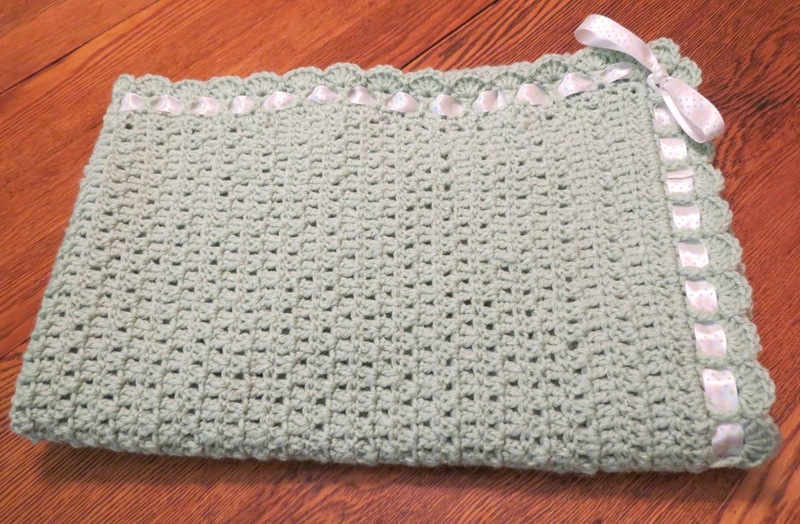 In my last post, I talked about helping a friend learn to crochet. 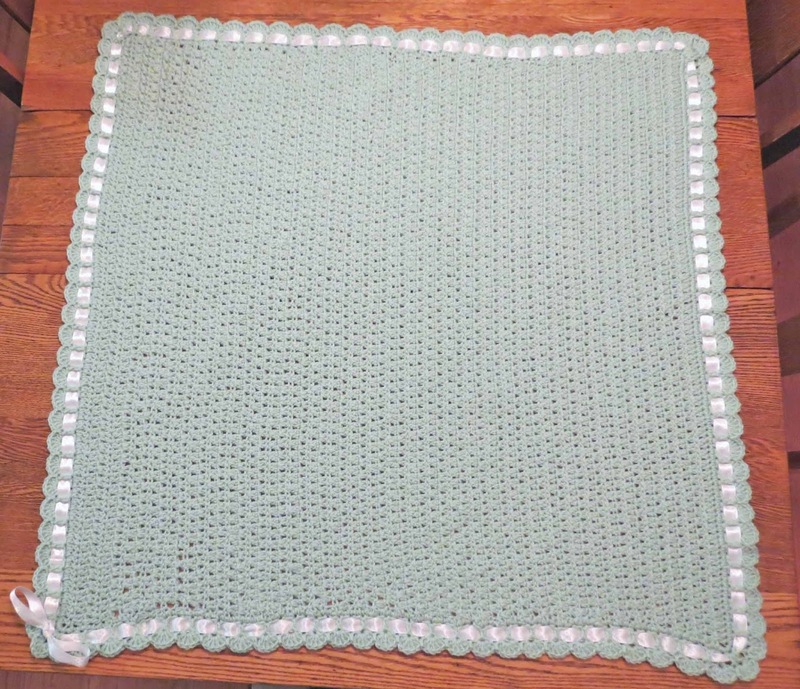 As promised, here are before and after photos of the baby blanket that my friend and I co-created:). Here it is before the border. My friend did a great job for a first timer! Then I put a border around it and finished it off with a ribbon and bow. The color is much different than shows in the photos. We used Red Heart Super Saver "Honey Dew". 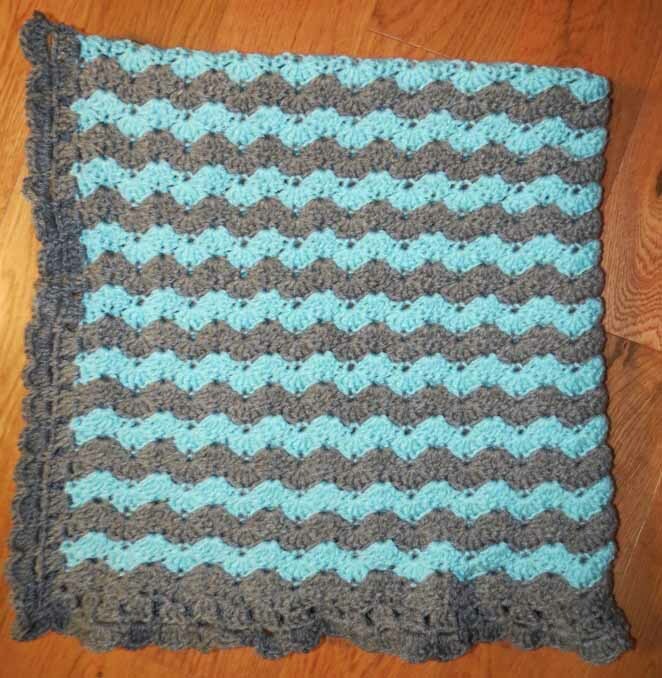 The pattern is "Tiramisu Baby Blanket" by Alicia Paulson. I have completed one of my Charity knitting goals. 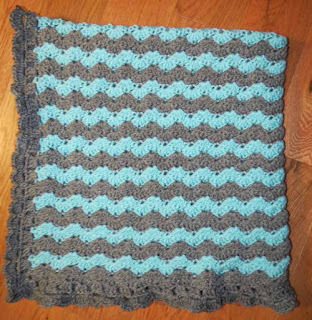 The pattern is Shell Stitch Baby Blanket by Nadia Fuad. Again the colors in the photo don't quite match the actual color of the yarn. The yarn is Red Heart Super Saver. The colors are Arub Sea and Grey Heather. 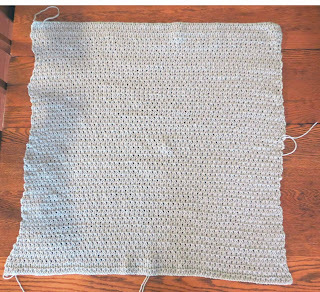 I've started my second blanket and am halfway done. After that, I will start on the baby hats I promised. The yarn is Red Heart Super Saver. The color is Pale Plum. 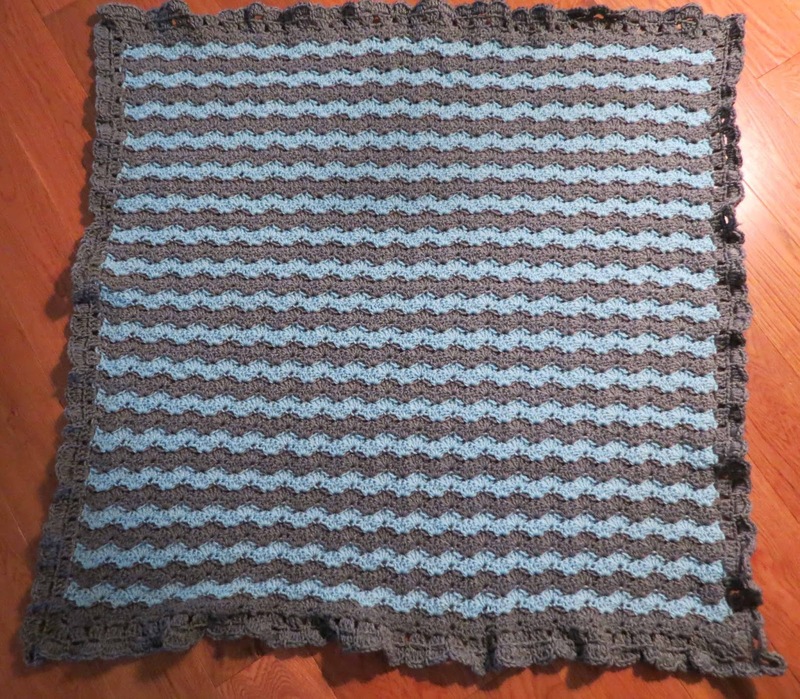 This pattern is called "Knit for Kids Bigger Kid Blanket". 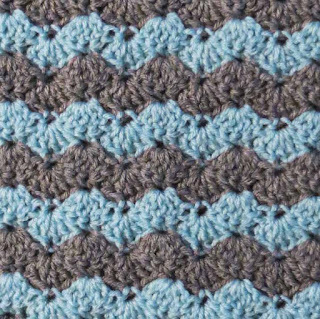 It is a pattern from the Premier Yarn Web site. A.C. More had free tear off instruction sheets in conjunction with their World Vision's "Wrap the World in Warmth - Knit for Kids" program. With every stitch, together we give hope and warmth to vulnerable children living in poverty or other difficult situations around the globe. For millions of children, a hand-made item isn't just a sweater, cap or blanket. It's a chance at better health. It's protection and warmth from freezing temperatures. And it's a symbol of support for a better future." I like what they have already accomplished and I've decided that I will be sending some of the things I make to this organization. On another note, Ross is going to be housebound for a bit. He fell and hurt his hip. Luckily nothing is broken, but he is in a great deal of pain. Then the other day, he decided to get into the hot tub over at the club house. He thought that might make his hip feel better. Which it did. But he cut his big toe when getting out and we had to take a trip to Urgent care to get it patched up. Maybe I will knit him a toe sock and a new hip. 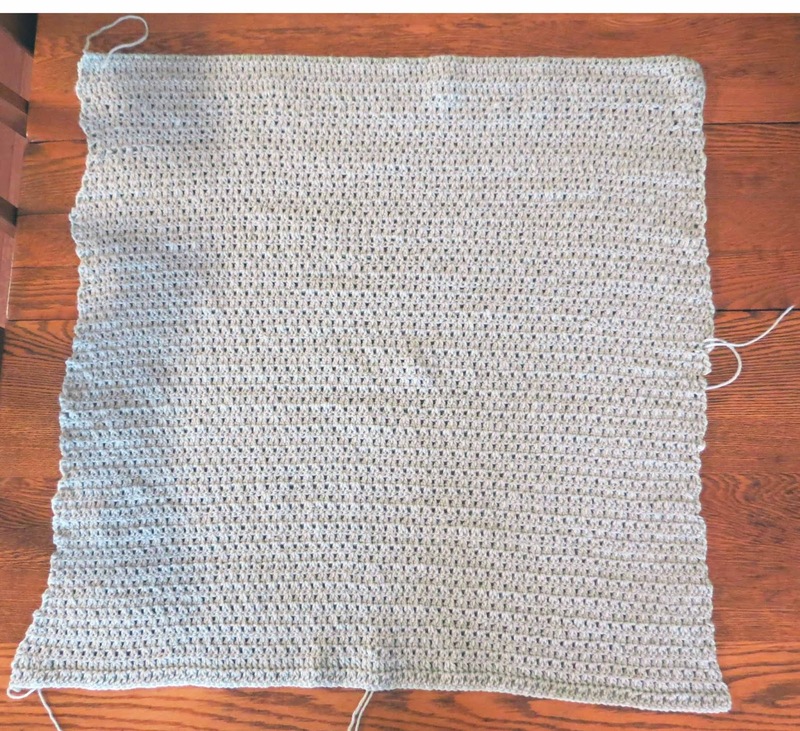 In my last post, I wrote about a dilemma regarding how I should advise a beginner crocheter on an obvious mistake she made on her first project. She was making a baby blanket for her pregnant daughter. I felt somewhat responsible since I was the one who taught her how to crochet. Should I have instructed her on how to fix the mistake? It would have involved ripping out quite a bit of the blanket. Or was the better option to smile encouragingly, praising her progress? I posed the question, "What would you have done?" "I'm thinking you offered to take the blanket from her and to fix it and finish it for her. What you regret is that you should have ripped out what went wrong, showed her that so she could learn from it and then have her continue making it." "I expect correcting that side would mean ripping back the whole blanket. 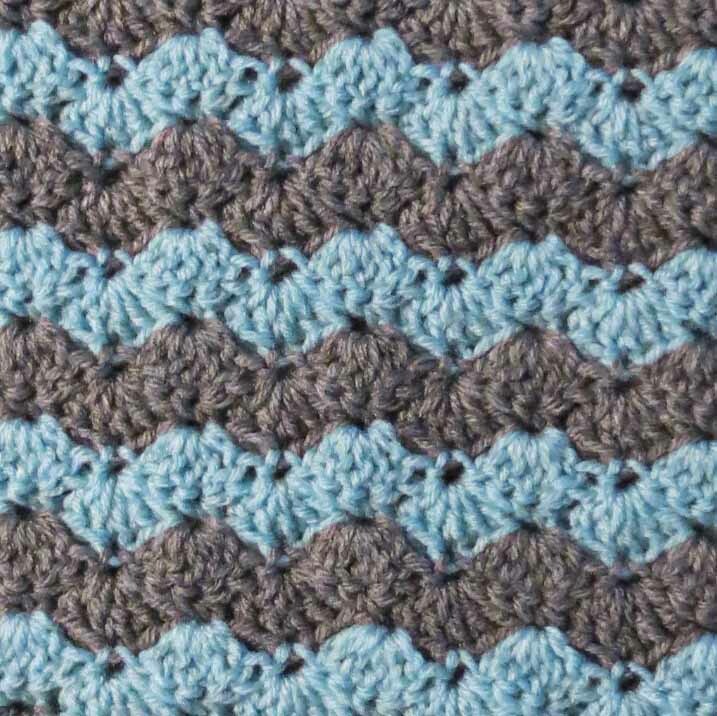 I think I would have tactfully mentioned how I used to struggle with turning at the end of crochet rows. Maybe the blanket can be used when the baby visits you. But if it is meant as a gift, your friend will probably prefer it to be straight. However, she has already said that she doesn't think it matters. That's a difficult quandry." "Well, I have to know what you did before I can know if it's the right thing. Because if it was me, I'd probably say "how lovely" and let it be. She's a beginner. It doesn't need to be perfect." Interestingly enough, I reacted in a combination of all three comments. 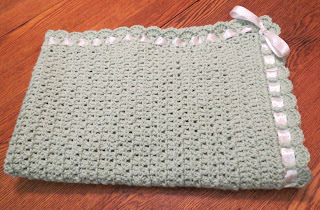 Betty, I am going to finish the blanket for her by crocheting a border around the whole thing. But, I do think it would be beneficial to explain what the mistake was and the correct way to finish a row. Una, I wish I would have thought quickly enough to tell her about my first-time crochet struggles. That is a regret, but I appreciate your good advice and intend to mention this to her at some point. Liz, I agree most with you. Involved in my split second decision was the thought that she is a beginner and no, it doesn't have to be perfect. So, I smiled encouragingly and praised her progress. She was so excited about the fact that she finally learned this craft after many failed attempts that I did not want to discourage her. I hope that I can manage to "hide" the little blip with a pretty border. I'll post a photo of it after it's all completed. 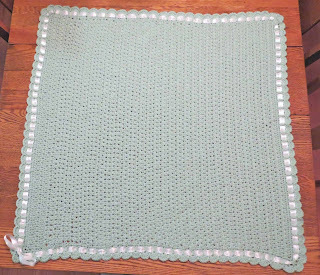 Also, on my last post I talked about my March goal to make and donate two baby blankets and four hats to charity. I believe it was fortuitous that I happened to drop into the "Nimble Fingers" group in our community where I found out that they were all knitting baby blankets and hats. They will be donating these items to CHOP, the "Children's Hospital of Philadelphia". 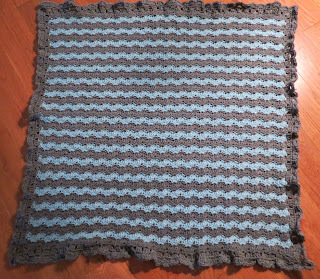 I am almost done with my first blanket. Photo's next time. 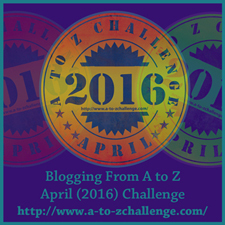 Oh, yes and I also signed up for participation in the "April 2016 A to Z Blogging Challenge". I will be posting every day, except Sunday, in the month of April using the alphabet. The topic of the first post will start with the with the letter A and the last post's topic will begin with the letter Z.